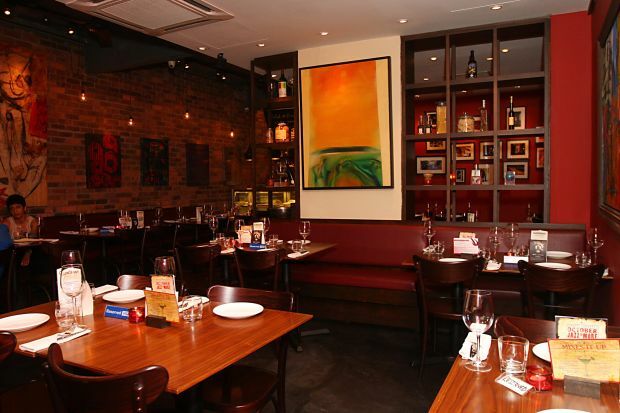 WHEN her customers first requested for dishes like lasagna and mac-and-cheese, Mezze Bistro owner Datin Shantini Sabapathy was quite reluctant to put it on the menu. “You can get them at many places but you can also easily go wrong with these dishes. Some of them tell me that they grew up on Mac and Cheese and its was something that would really like to have here so I thought if I was going to make Mac and Cheese, it better be the best that they can get,” she said. Shantini worked closely with chef Yves Renou to get the recipes right and just the lasagna itself took two months to perfect. “I will only feed my customers what I myself would eat. We create food that not only tastes good but is also high in quality. We make our own burger patties, sausages and even sauces,” she said. 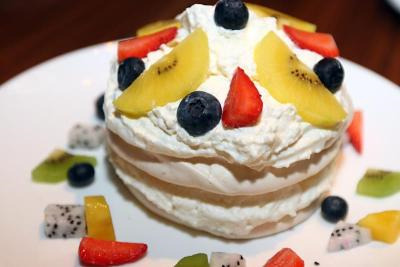 Rich: Mezze also has a variety of delectable desserts,like this Pavlova. A regular traveller, she picks up ideas for dishes from the places that she eats at when visiting different countries. “I would try something really great and I would come back and work on a recipe with the chef. A lot of our food are inspired by classic stuff but we do our own take on it without being too clever. It’s all about good, unfussy food,” she said. The restaurant’s Chartucerie Platter works well as a sample of chef Renou’s expertise, with his hand-made terrines and pates served alongside a selection of cold cuts and pickles. “We even pickle our own vegetables. The bread basket that comes with the platter is served with French butter which our supplier has to specially source for us,” she said. Having a lot of customers who eat there often, Mezze has a special menu which they change every two weeks. 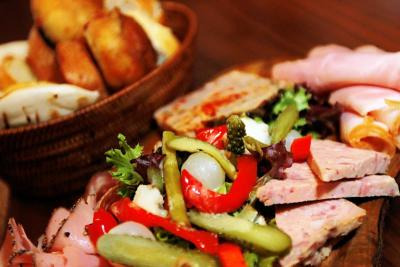 Assortment: The Chartucerie Platter consists of a variety of cold cuts, hand-madeterrines and pates and pickled vegetables served with a bread basket. “We want to give them a bit of variety whenever they come here. Sometimes, the dishes on the weekly menu are so popular that they request for it to be put on the regular menu. That’s how we evolve the menu over time,” she said. Besides the Lasagna and Mac and Cheese, the restaurant recently introduced several other new dishes to the menu, some which have Asian-inspired flavours like the Asian-style Spicy Buffalo Wings and the Momofuku Pork Belly Rolls. “We have also introduced more dishes that come in smaller portions which are perfect for sharing because some people like to try a bit of everything instead of having their own mains. These tapas-sized dishes are also good for our customers who just want something to munch on while they have their glass of wine or a beer,” she said. Rather than the regular sourish Buffalo Wings typically found in American restaurants, the ones at Mezze had a refreshing tangy and sweet sauce. The wings were also coated with a sprinkle of sesame seeds which gave it that bit of extra aroma and crunch. The Momofuku Pork Belly Rolls was adapted from a dish at a New York restaurant and was first introduced in Mezze’s special menu. Hearty noodles:Mezze’s Vietnamese Beef PhoNoodles, which is only available during lunch on Fridays and Saturdays, has a thicker broth cooked with oxtail. “When we took it off the menu, some of our customers actually got upset so we decided to feature it as a regular dish,” she said. The tasty Roasted Pork Costillas turned out to be a good complement for a serving of cold beer and not a dish to order if you insist on eating with your cutlery. Whether the Lamb Merguez, served with some herb-infused cous cous, should be shared as a tapas or not is highly debatable as the flavourful grilled lamb sausages made for a decent-sized main on its own. The Artichoke Dip was another dish inspired by something that Shantini sampled at a restaurant in New York. “My daughter introduced it to me and it was so good that I had to recreate it when I got back,” she said. The rich and creamy dip was slightly addictive as the cheesy flavours dipped with the toasted crostinis (small slices of toasted bread) melts on the palate. 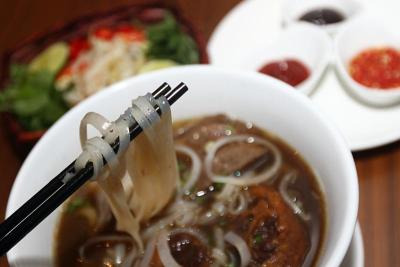 For the Friday and Saturday lunch crowd, Mezze has also introduced its version of the Vietnamese Pho noodles which has a heartier soup made with oxtail as compared to the original broth that is lighter.